With all the parts on hand and after a lot measuring, I ordered a Zalman CNPS 7500 AlCu CPU cooler. This cooler seemed to have the best reviews of anything that I could find that would fit into this case. Given the low profile nature of the case, my choices were greatly limited. Assembly went well without any major snags. I decided to forgo any kind of cable management as I was more concerned about verifying all the components worked correctly in case I had to return something. I will clean the cables up later once I know everything works properly. The biggest challenge in assembling the system was figuring out how to hook up the VFD panel since there was no documentation present and the connectors were not clearly marked. There are four different plugs on the VFD, some obvious like the USB plug, while others weren’t so obvious to me. Luckily I tracked down the information and wiring schematic on Soundgraph’s website. 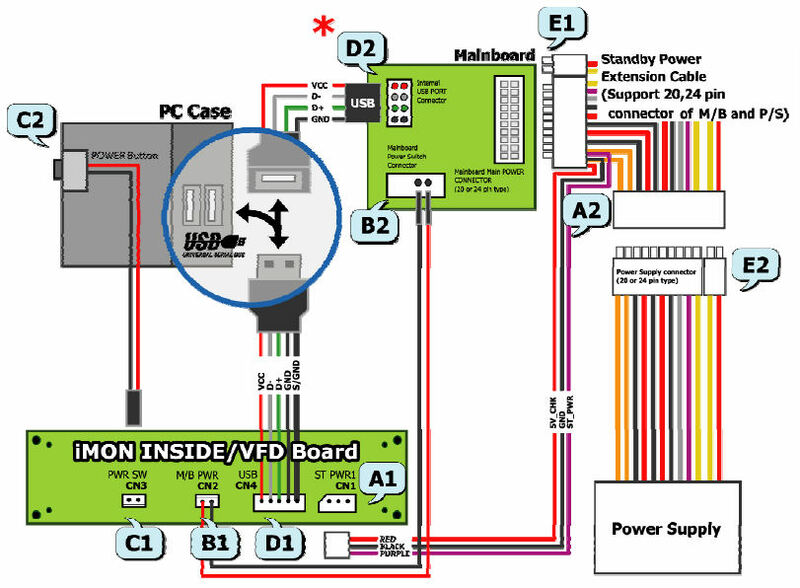 It then made perfect sense to connect the case’s power button connector to the VFD panel, and the VFD’s power connector to the motherboard’s power button header. This allows the computer to be powered on via the remote control – a nice feature! This left two more connectors on the VFD to deal with – the USB header connector (obvious) and a two pin power connector that draws power from an odd adapter that taps power from the PSU to motherboard’s large 24 pin power connector. 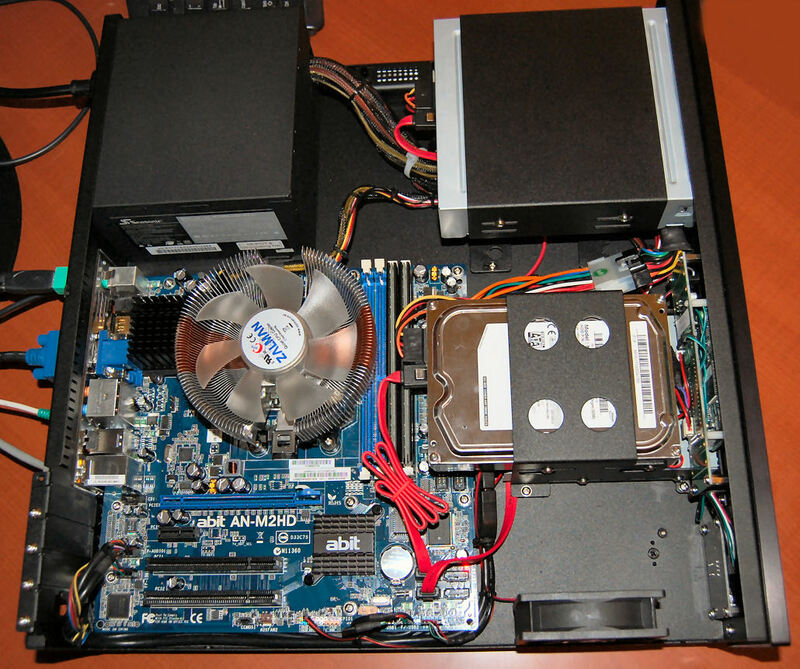 Though the Zalman cooler fits the case nicely, you loose two DIMM slots for the ram. You could probably utilize the two front slots, but I think the top of the ram would probably just make contact with the radiator fins on the cooler. Clearance would be very tight and might cause thermal issues. I just moved the two sticks of ram to the outer two slots. Aside from this, there are no other clearance issues with the Abit AN-M2HD board and the Zalman cooler. The cooler comes with a three pin connector and does not use PWM but instead comes with a rheostat which allows you to dial the fan’s speed up or down depending on your needs. 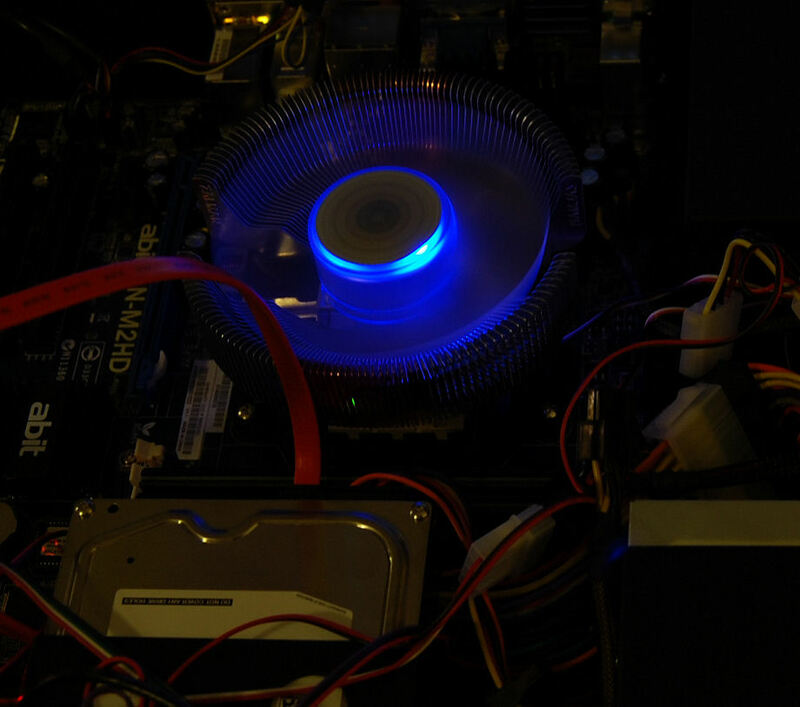 The cooler also has a gimmicky blue LED. Cables better organized to increase airflow and appearance. Extra PSU cables are hidden in the unused drive bay located under the optical drive. 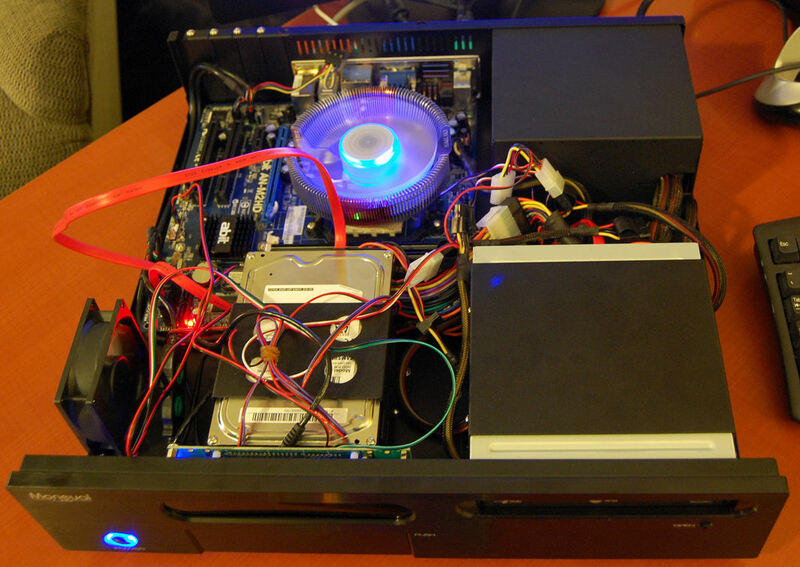 The Zalman fan control is shown between the PSU and optical drive. I need a short SATA cable for the hard drive but this works for now. Cable routing turned out to be a huge challenge and took me the better part of a Saturday afternoon. I was hoping for a little more clearance under the motherboard to hide some cables, but clearance is tight so I routed many of them on the outer edge of the motherboard. The area located under the optical drive (the second hard drive bay) also conceals the PSU cables, including the large Molex cables. 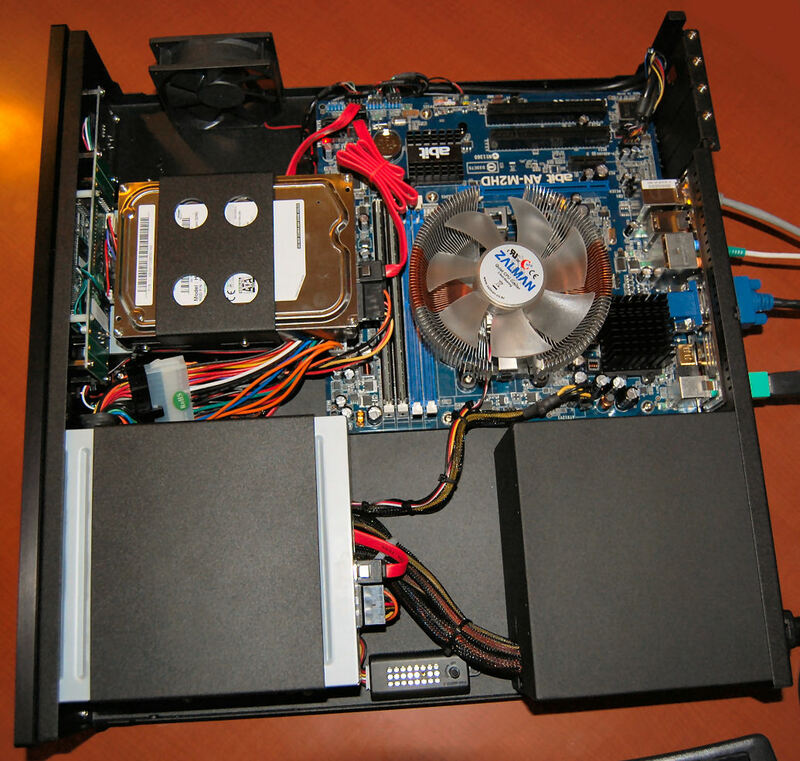 By default, the case fan is used to exhaust stale air from the interior of the case but I suppose it could be reversed to blow cool air directly to the hard drive. I may explore that later if thermal issues crop up.